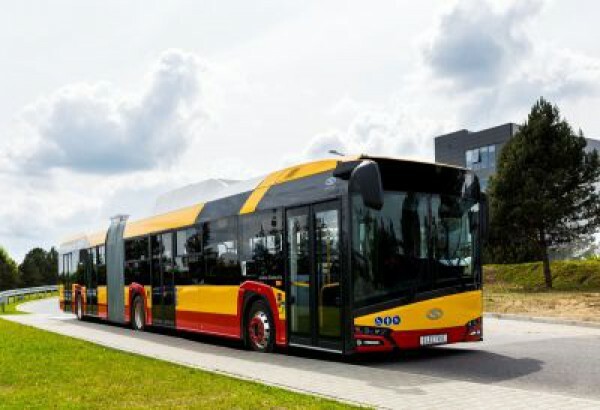 The Municipal Bus Company in Warsaw has just leased an 18-metre-long Solaris Urbino 18 electric. It is the first vehicle of that kind in the capital and one of the first electric articulated buses in Europe. The batteries in the articulated buses can be charged either by means of a plug-in connector or via a pantograph. The bus has been equipped with air-conditioning, an electronic passenger information system, a vehicle monitoring system and fire prevention systems. The vehicle is fitted with two 120 kW e-engines integrated into the drive axle and high capacity Solaris High Energy batteries, which allow for a travel distance of more than 200 kilometres per charge. The Municipal Bus Company has some experience in operating electric buses, the first battery vehicles having been tested five years ago, and in 2015 the first batch of ten electric buses being ordered. Currently, the Solaris Urbino 12 Electric buses provide services on line no. 222 which runs predominantly along the Royal Route. Until last July the vehicles were charged only by means of a plug-in connector, which allowed for a travel distance of around 130-150 kilometres. After putting into operation the street charging station at the Spartańska bus terminal, the vehicles can now recharge their batteries by pantograph and thus cover much longer distances. Two years of operating the buses has shown, that they are very energy-efficient; fuel costs are much lower in comparison to the cost of diesel engines and they work well in winter. In spring of 2018, another batch of ten Solaris electric buses will arrive in Warsaw. These will be fourth generation Urbino 12 electric buses which will also be put to use on the Royal Route.